The women’s suffrage parade of 1913 was a big deal. Women from all over the country descended on Pennsylvania Avenue and threw their cause in the face of all the men attending Wilson’s inauguration the next day. As the women began to march, men started to harass. They marched amid jeers, taunts, grabs and shoves from men. Even the police didn’t protect them, but the women kept marching. 100 women were taken to the hospital. Eventually a cavalry troop was called in to work crowd control. Amid the chaos was a group of 23 Missouri women equipped with the power of music, and they were pushed to the front to calm the crowd. Alma Nash was the daughter of a Maryville surgeon. She spent her life studying music, and founded the Maryville School of Banjo, Mandolin and Guitar. She held classes in a building on Buchanan Street, where Alma looked to her pupils to form an all ladies concert band. 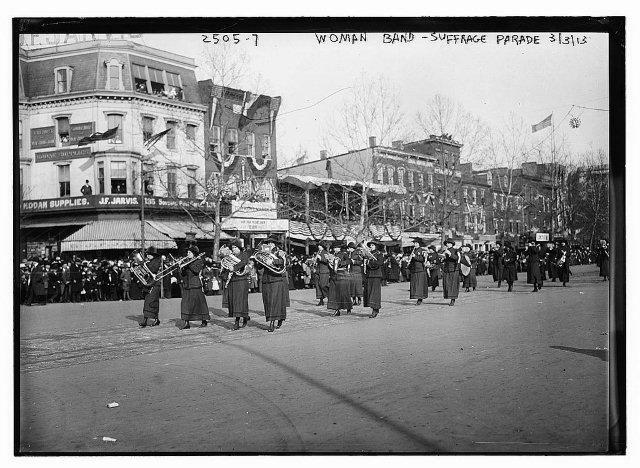 In late January of 1913 Alma received a letter from the National Suffrage Association and she transformed her all ladies concert band into the first all ladies marching band. 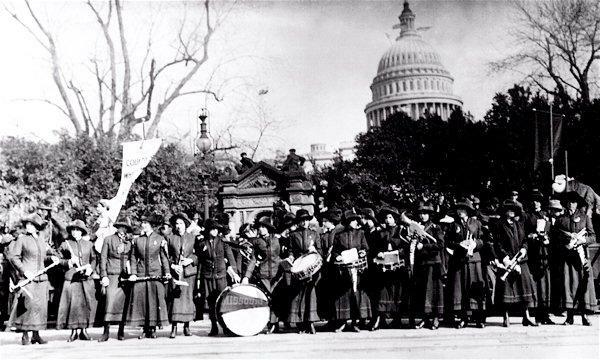 The women spent the next month raising money for their trip to Washington DC to march in the Women’s Suffrage Procession on March 3, 1913. On her return, Alma Nash told a reporter in Maryville, “These women were part of one of many remarkable stands for women’s suffrage.” It would be seven more years before the government granted women equality, and without participation by women all over the country it would not have happened. Alma moved to Kansas City eventually, lived at 207 E 39th Street and played in the orchestra at the Doric theater. She continued to teach music to hundreds of students. This post was made possible by Melissa Middleswart and Meghaan Binkley from the Nodaway County Historical Society, where you can visit an exhibit about the band, see Maye Shipps Corrough’s trombone and one of the lady’s uniforms worn at the parade. The museum is located at 110 N. Walnut in Maryville and is open 1-4 Tuesdays – Fridays or by appointment. View the official program from the March 3, 1913 Women’s Suffrage Procession. My brother and I took lessons from her from 1961 to 1963. My brother hauled his guitar and I my mandolin on the bus and transfered to get to the 200 block of E 39th in Kansas City, MO. We had some practices in her all string band. I would love to have a copy of some of the sheet music we played. An incredible woman.